Samsung's Micro LED TVs made another appearance at CES 2019. The technology has come far enough to allow for various display sizes thanks to the modular panels housing the Micro LEDs. 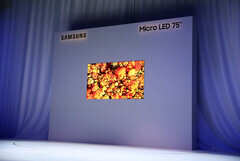 Additionally, Samsung is claiming that Micro LED (MLED) displays will have the same deep colors and high contrast of OLED displays without the burn-in worries that come with OLED. Initial impressions for MLED TVs are good, but Samsung says that the technology won't be ready for consumers for several years. Samsung wowed the audience at CES 2018 last year with “The Wall,” a massive 146-inch (diagonal) modular 4K TV made up of smaller display panels that used the company’s new Micro LED display technology. 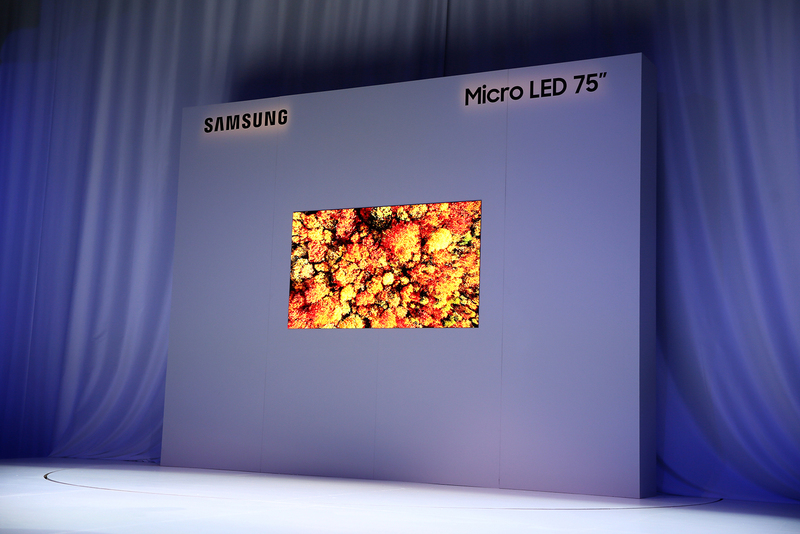 This year at CES 2019, Samsung is taking the tech a step further by building TVs in multiple sizes and showing just how good Micro LED (MLED) can look. The company showed off its MLED tech with a more reasonably sized 75-inch 4K TV. The TV was made up of panels in the same manner as The Wall from last year, but these panels can be used to make a TV of any size. Want a bigger TV? Samsung showed off a 219-inch version of The Wall. Want a display with a unique aspect ratio? MLED panels can be arranged in multiple ways for different aspect ratios. Samsung says that MLED panels can support aspect ratios like 32:9 or 1:1 without sacrificing image quality. Despite being constructed from individual panels, the bezeless design of each MLED panel makes the seams between pieces difficult to spot, especially once the individual MLEDs light up. The MLEDs themselves are microscopic LED chips that can light up or turn off individually. This, in turn, creates stunning images on an MLED display. If the individual backlighting sounds familiar, that’s because Organic LED (OLED) displays work in a similar fashion. Each pixel in an OLED panel lights up independently of others, allowing for true blacks and near infinite contrast ratios. However, due to the organic materials used in OLED displays, the tech has some major drawbacks. OLED panels typically have shorter lifespans than traditional LCD displays. Burn-in is also a major hurdle and may be one of the primary reasons the tech hasn’t caught on in devices with screens that tend to have static elements, like computer or laptop monitors. Samsung claims that MLED panels don’t have these issues. Since the technology doesn’t rely on an organic compound, there’s less wear-and-tear to worry about. There’s also less risk of burn-in since the LEDs aren’t shining through organic layers. MLED TVs will have their own challenges, primarily in the manufacturing process. The pitch, or distance between LEDs, is small. The LEDs themselves are measured on a microscopic level (Samsung has not released details on exact pitch measurements or LED size). Additionally, the modular nature of MLED displays introduces more room for error. While Samsung hasn’t yet announced pricing for MLED TVs or displays, the manufacturing costs are likely not insignificant. That cost will probably be passed on to the consumer in some. MLED displays are still years from entering the consumer space, but Samsung is continuing to push the tech as the future of TVs and screens. Initial impressions from the tech media are very good; many outlets are claiming that the image quality is as good as or better than OLED, which is high praise. Maybe we’ll all be building our own TVs out of MLED panels in 2025. Start saving up for it now.